On September 19 the top leader of the Vatican arrived in Havana, where he was welcomed in an official ceremony by Cuban President Raul Castro and Cardinal Jaime Ortega. 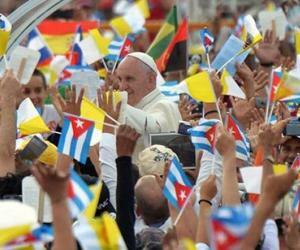 The next day, the representative of the Holy See offered a Mass in the Revolution Square in Havana. The event was attended Raul Castro accompanied by the President of Argentina Cristina Fernandez and other representatives of the government and the Cuban Church. In the afternoon, Francis visited ex Cuban president Fidel Castro. After the visit to Fidel, the pope attended the celebration of Vespers with priests, religious and seminarians in the Cathedral of Havana, where he took a moment to share with the youth of Father Felix Varela Cultural Center in Havana. The maximum figure offered a Catholic Mass today in the eastern province of Holguin; he also blessed the city from the famous Loma de la Cruz. Tomorrow, in Santiago de Cuba he will offer another Mass in the lower Basilica of the Shrine of Our Lady of Charity.